The athame is a knife that is used by a Witch not for cutting, but rather to direct energy in ritual. The athame is often dull, usually double-edged with a black or dark handle. Your athame may be engraved with magickal symbols but this is not really necessary. A sword has the same function as an athame. These ritual tools are both linked to the element of fire and, due to their phallic nature, often used as a representation of the God. See a selection of athames here. Besoms of old were made of willow binding, birch twigs, and ash staff, though any natural material can be used today. The boline is a (traditionally white-handled) knife used by a Witch for practical purposes rather than ritual ones. It is used for cutting herbs, cords and wands, or for inscribing symbols. This tool can be used both inside and outside the circle. The Book of Shadows (also known as a Wiccan grimoire) is the Witch’s personal workbook which contains invocations, spells, notes, runes and more. It can be a physical notebook or stored on a computer. Your Book of Shadows is highly personal and you can get creative with the look and design of it. For more information, read my article How to Create a Book of Shadows. See a selection of journals which can be used for a Book of Shadows here. The cauldron is a traditional vessel of cooking and brewing. It symbolises transformation, as well as fertility and femininity. It corresponds to the element of water and the Goddess. The cauldron is often used as the focal point of the ritual, due to its multipurpose nature. Traditionally, cauldrons are made of cast-iron and have three legs. See a selection of cast-iron cauldrons in all sizes here. The censer is a ceremonial incense burner. It holds the incense during ritual. Any bowl or cup can be used for this purpose. The act of burning incense and breathing it, can sometimes bring forth an altered state of consciousness. It is often placed before the images of deity on an altar and corresponds to the element of air. See a selection of incense holders and burners here. The Witch’s chalice serves a similar purpose to the cauldron, except in a smaller capacity. It can be used for mixing potions, for holding salt water to cleanse objects with, or to hold ritual wine or other liquids. The chalice symbolises the Goddess and fertility, and corresponds with the element of water. See a selection of chalices here. Crystals can be powerful magickal tools since they hold and emanate healing energy. You can use dedicated crystals for spells, or you can simply place crystals around your home or carry them on your person in order to absorb some of their healing energies. The most versatile crystal is crystal quartz, since it is a powerful amplifier of energy and can hold any vibration that you charge it with. Other crystals can be used for more specific purposes – for example, rose quartz for love, citrine for abundance, onyx for protection, and so on. See a selection of crystals here. This is not a traditional Wiccan tool, but one that I have none the less found to be extremely useful in my rituals. Orgonite is a crystal amplifier – a healing tool that amplifies the power and range of crystals. It also holds magickal intent very well. Basic orgonite is created from resin, metal and crystal quartz, although other ingredients can be added to it to improve its function. You can read more about orgonite (including my experiences with it and how to obtain it or make it yourself) here. The pentacle is a flat disc which is inscribed with a symbol, most commonly the pentagram which is a five pointed star that has been used in magick for thousands of years. The pentagram represents the five elements: air, water, earth, fire and spirit. 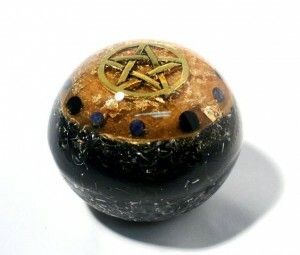 The pentacle itself can be made of any material, including brass, gold, silver, wood, wax and clay. The pentacle is an instrument of protection and a tool used for invocation. It is sometimes considered to be a portal between this world and the spirit world. Sometimes, it is hung above windows and doors due to its protective qualities. The wand has been used for thousands of years as a primary magic tool. It is an instrument used by Witches to direct energies, draw circles and to create magical symbols. It is linked to the symbol of Air, a sacred element of the Gods. Wands are traditionally made from willow, elder or oak, though almost any material can be used to create a wand. Sometimes crystals are added to the tips of wands, since crystals amplify the energy sent through the wand. See a selection of magick wands here. Note: All tools should be ritually cleansed, consecrated and charged. Want ideas on how to make your own Wiccan tools? I’ve included a chapter called The DIY Altar in my new e-book, The Essence of Magick.